This is an event like you‘ve never seen! 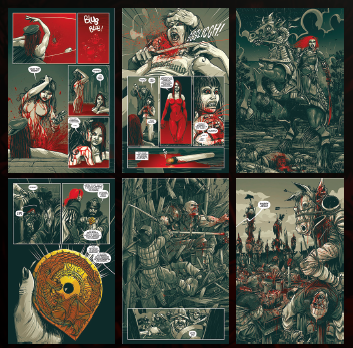 Join Alec Worley and Pye Parr signing THE REALM OF THE DAMNED at the London Megastore on Saturday 15th September from 1 – 2pm – and see metal musicians THE SONS OF BALUAR as they take the store by storm! AS FEATURED IN THE REALM OF THE DAMNED, THE SONS OF BALUAR WILL BE AT THE STORE FROM 11am. DON‘T MISS OUT! 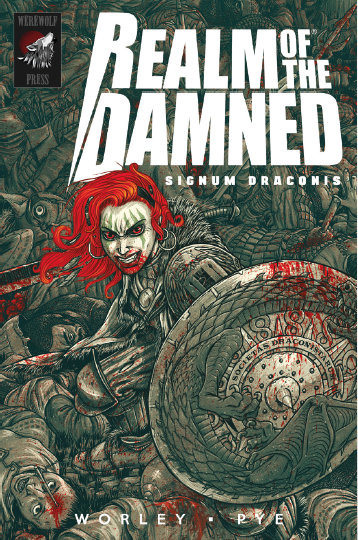 SIGNUM DRACONIS is the eagerly awaited second instalment of REALM OF THE DAMNED, the bestselling graphic novel series that is taking the black metal underground by storm. This epic medieval prequel tears into the series‘ bloody history, unleashing bizarre new monsters and yet more guest appearances from legends of the metal scene. Book two of this Horror Metal series. Book one Tenebris Deos is released on DVD and video platforms as an animated motion comic with voices from Dani Filth (Cradle Of Filth), David Vincent (Morbid Angel) and Jill Janus (Huntress). Written by well-respected 2000AD (amongst others) writer Alec Worley, graphic art by well-respected 2000AD (amongst others) artist Simon ’PYE‘ Parr. Book one was a hit with all fans of the horror genre as well as legions of heavy metal fans. Book one serialised in 2000AD‘s Judge Dredd Megazine. All names, characters, places and events featured in this book are fictitious. Any resemblance to real persons, living, dead or undead, is purely coincidental.